Savannah – our last few days – Live MoHo! We started our back half of the Savannah week with some thunderstorms. Things got interesting when lightning bolts were raining down on our head! 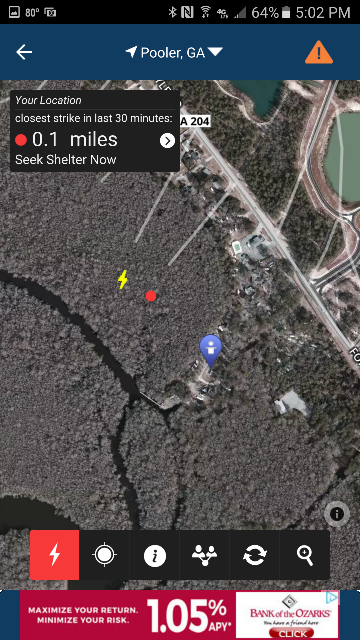 According to WeatherBug, the closest strike was less than 500 feet away! 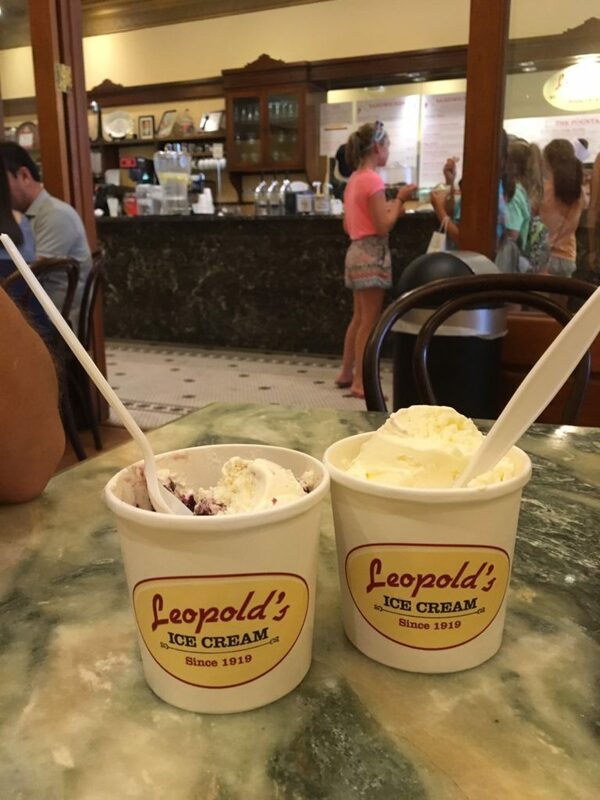 Even though we had a close call, I’d have to say that – so far – weather on the east coast hasn’t been that bad. Of course, we got out of northern Florida just before the massive drenching storm that hit, so maybe its just our good luck. Still, the most violent thunderstorm we have seen so far was in New Mexico. Anyway, we got up early ( by which I mean at 8:00am) so we could head to Tybee Island. Along the way, we wanted to stop at Fort Pulaski. Fort Pulaski is interesting in and of itself, being the pinnacle of masonry/stone fort technology. 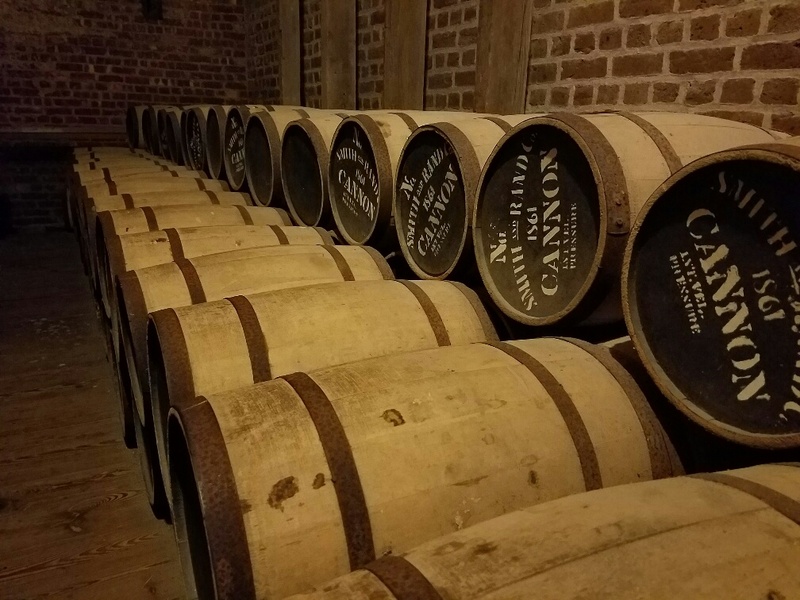 Its the ultimate evolution of the style of fort we first saw with the Castillo in St. Augustine. And, it is in extremely good condition. 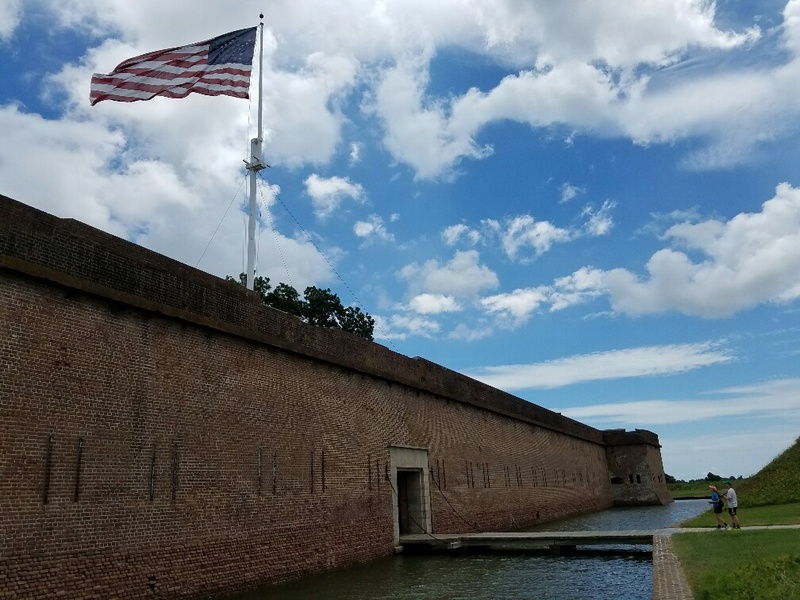 The fort was started after the war of 1812 when President Andrew Jackson wanted a series of fortifications to protect against future attacks on the USA by sea. 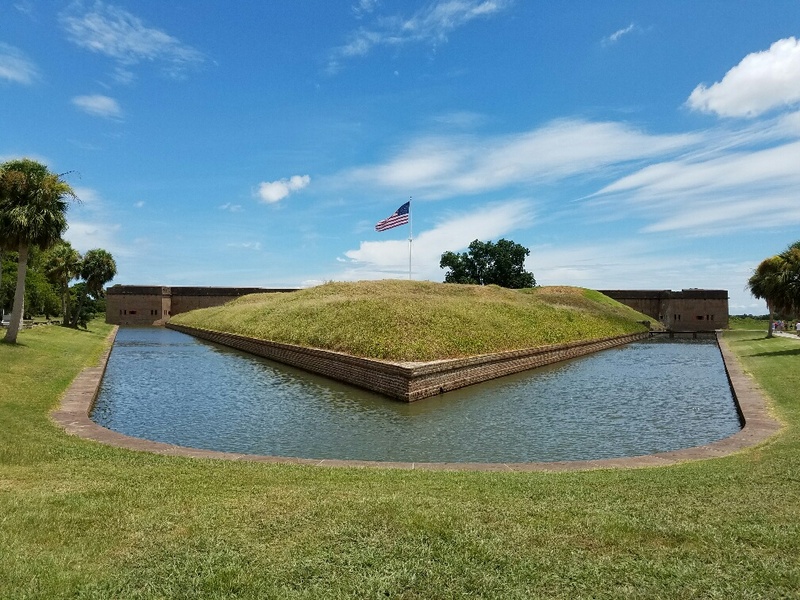 In 1829, construction finally began on the fort that would protect Savannah – Fort Pulaski. Robert E. Lee himself had a hand in the fort, which he described as impenetrable. Lee remarked that “one might as well bombard the Rocky Mountains as Fort Pulaski”. There was reason for the confidence. 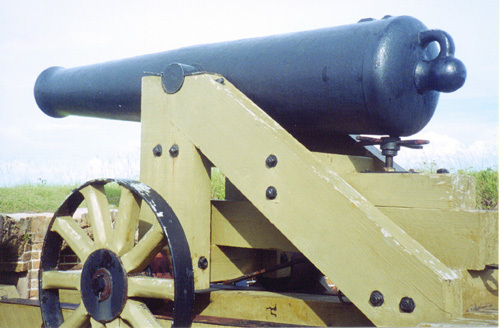 Ft. Pulaski was designed to withstand the strongest arms of the time – smoothbore cannon. Smoothbore cannon of the period had a maximum range of about a mile and a half. The nearest land to Ft. Pulaski was Tybee Island, much further away. Ft. Pulaski is on Cockspur Island. The fort is surrounded by a moat, and the entrance is protected by a spear-shaped artificial island. 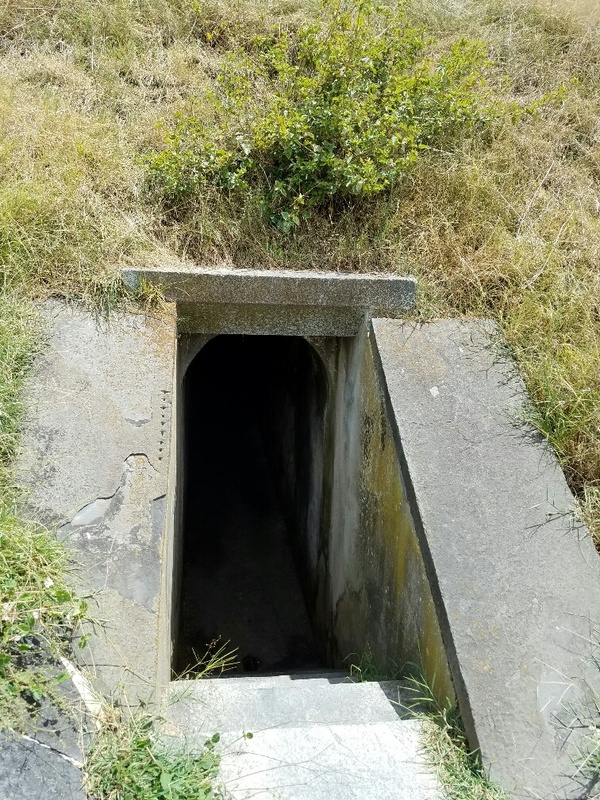 Inside the protective island are tunnels and bunkers that could be used by defenders. With thick earthworks over the tunnels, even the entry island to Ft. Pulaski looks like a fortress. The fort itself is made from an estimated 25 million bricks. I can’t even imagine how something like this was handmade, but it was. The fort bristled with cannons ready to fire on anyone foolish enough to get close. 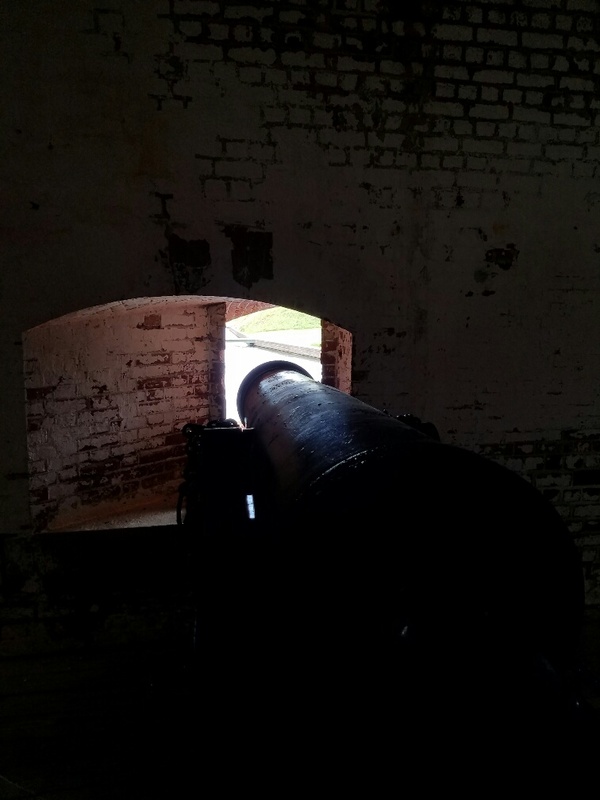 Anyone stupid enough to try to get guns near enough to the fort would find themselves the subject of target practice by the defenders and its battery of cannons. 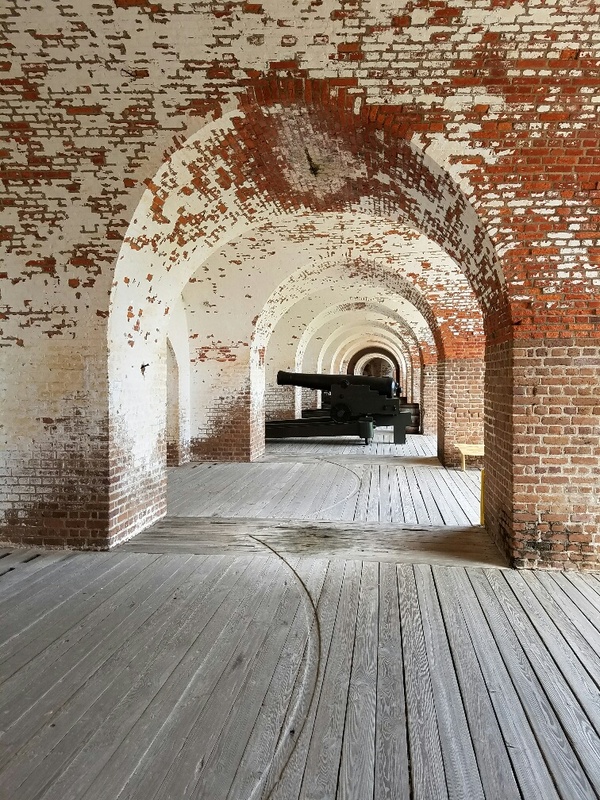 Its no wonder why Robert E. Lee and others, including the Fort’s commanding officer, Colonel Olmsted, considered the fort impregnable. But like that old joke about bringing a knife to a gunfight, technology often has a way of radically altering the history of warfare. Particularly when the military is often preparing to fight another war like their last war. Little did Olmstead know, but that technology was forming up across the Savannah river. Under cover of darkness, the Union forces were assembling new experimental rifled cannons. Night after night, these experimental cannons were moved into place. Olmstead never suspected. And if he had received word, he would not have been much concerned as the far shore of the river was well beyond the 1.5 mile range of any cannon large enough to do damage. Olmstead was prepared to withstand a monthlong siege should any cannon come close and he reckoned that he would see those cannons being wheeled into place. What he couldn’t see were the secret weapons – the most advanced guns of their day – rifled cannons firing new bullet-shaped shells. 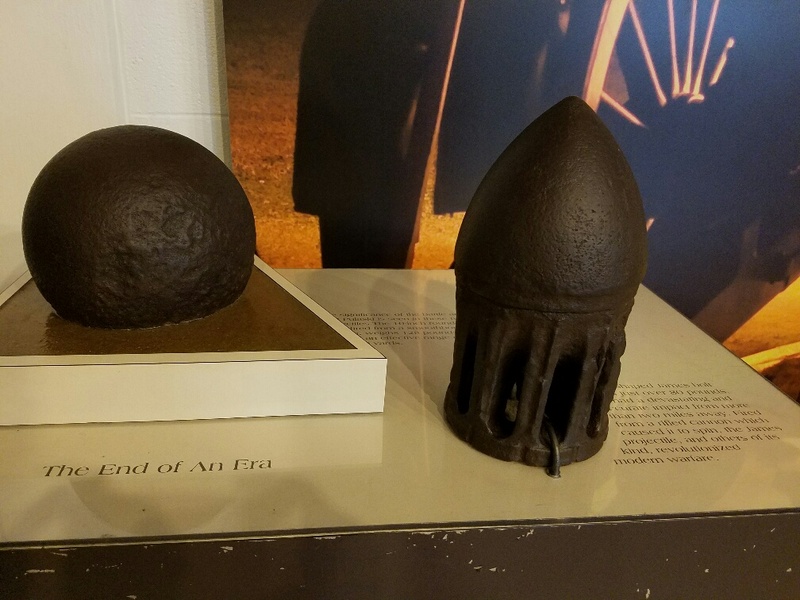 These cannon could accurately fire 4-5 miles and the shells did much more damage on impact. On April 10th, 1862, word was sent to Olmstead demanding he surrender Ft. Pulaski to the Union forces. Olmstead refused, clearly amused by the audacity of the Yankees who had no chance of doing any damage from the far bank of the river. The Union forces opened fire and the new rifled cannon immediately began to tear holes in Ft. Pulaski. 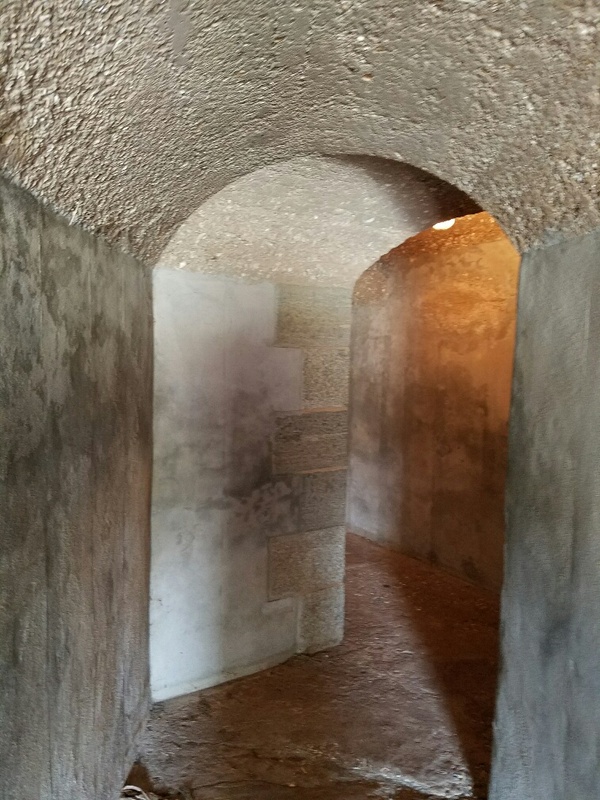 In short order, the exterior walls had been completely breached and shells were passing through the gap to the opposite side of the fort. Which was where the powder magazine was located. Olmstead had no choice but to surrender. In less than 30 hours – just a day and a half – the fort as impregnable as the “rocky mountains” had fallen. This battle marked the end of masonry fortifications forever. The Union quickly rebuilt the fort and used it to prevent any shipping through Savannah. Lacking the new rifled cannon technology, the Confederate army found Ft. Pulaski to be the impregnable fortress they assumed it was. 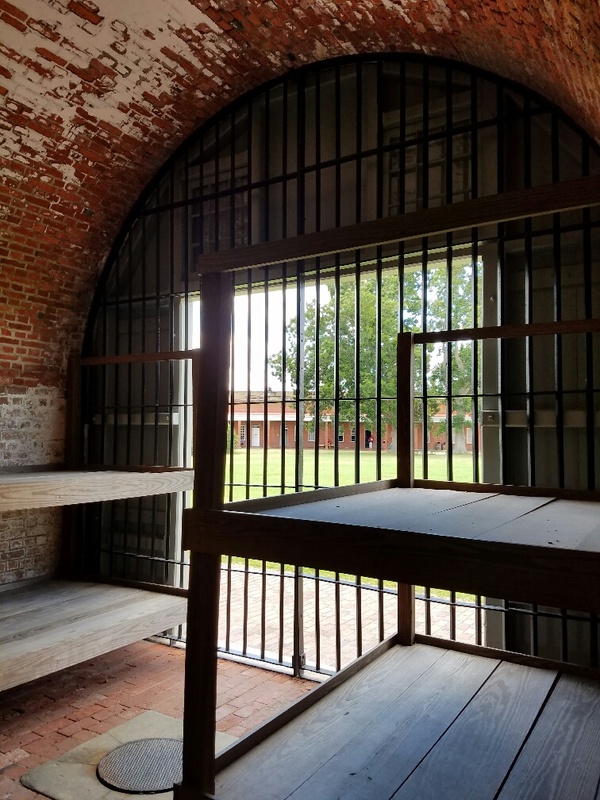 Later, the fort was used as jail for captured Confederate soldiers. Many of the iron bars are still present. No longer keeping people out, the fort now kept them in. After Ft. Pulaski, we continued down the road to Tybee Island. We could see the Tybee Island lighthouse from Ft. Pulaski and went to see it. We found it similar in many ways to the lighthouse at St. Augustine. One difference was the decking of the observation level. Much less solid feeling and more exposed than St. Augustine. There is a 1.5 inch gap between the metal decking plates and the side of the lighthouse and guests can look straight down to the ground below. 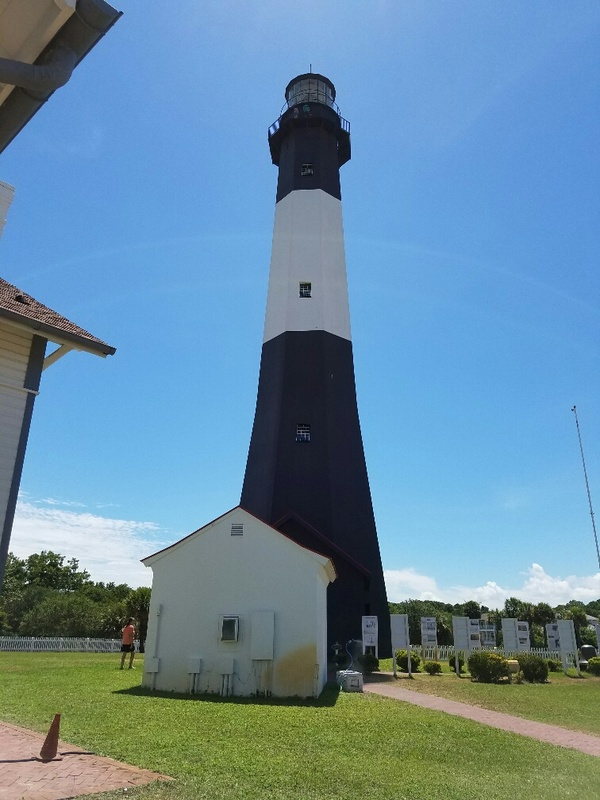 Like St. Augustine, the Tybee Island lighthouse was upgraded to a first order Fresnel lens. 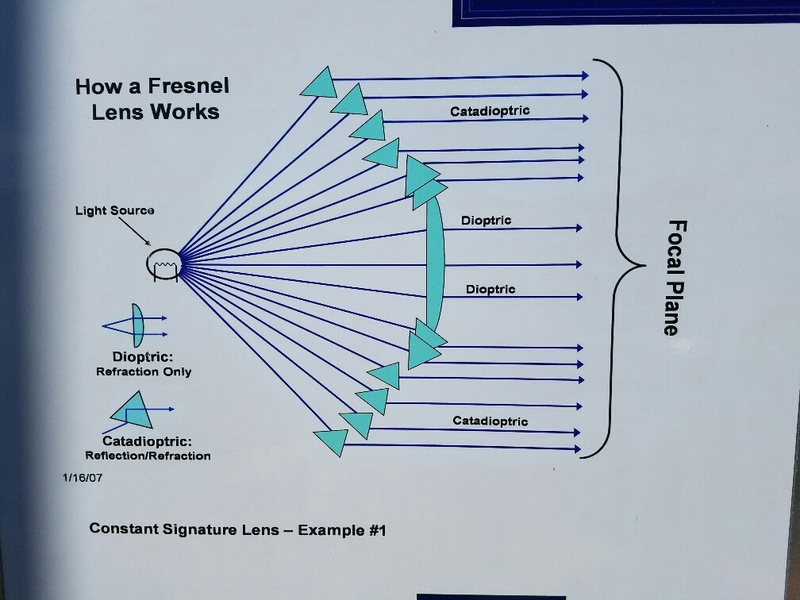 This type of lens uses a variety of glass prisms to focus the light and magnify its visibility. 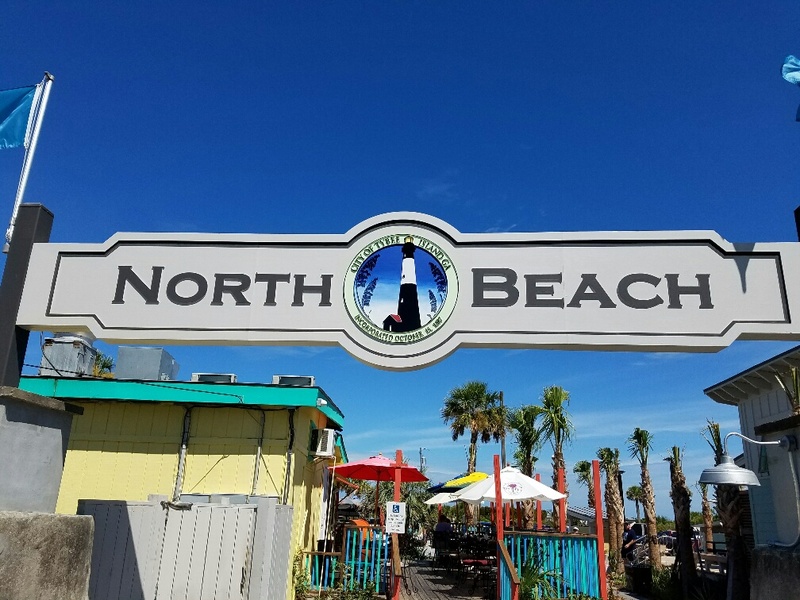 Across from the lighthouse is North Beach. It is quite popular with the locals. We didn’t have time to check it out, but would like to someday. We headed back toward the MoHo and stopped at the Savannah Mall where Texas Roadhouse is located for supper. Ok – its AUGUST people. 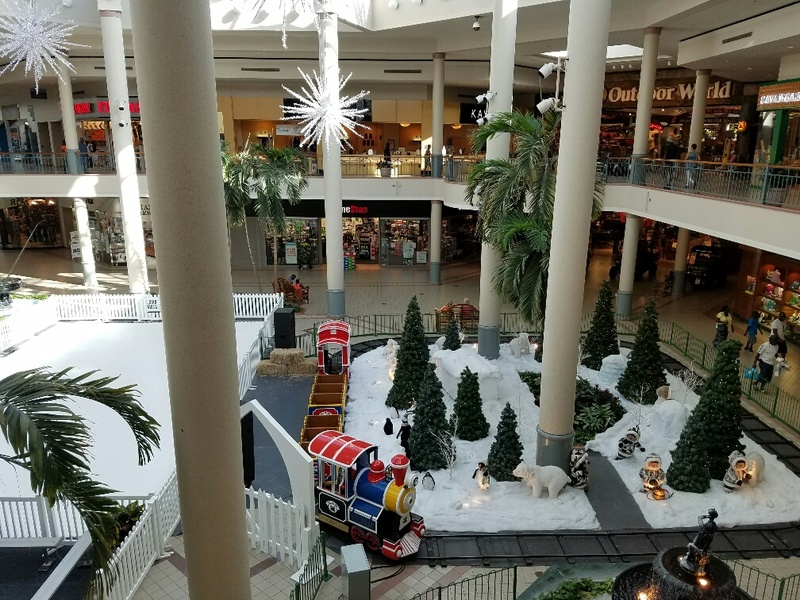 Way, WAY to early for Christmas decorations!!!!! After the ridiculous Christmas in August, we returned to the MoHo to sleep off the Roadhouse food coma. The cicadia are just about as loud as traffic noise! The next day we headed back to Savannah to properly explore the downtown area. We took the Old Town Trolley Tour which I highly recommend! 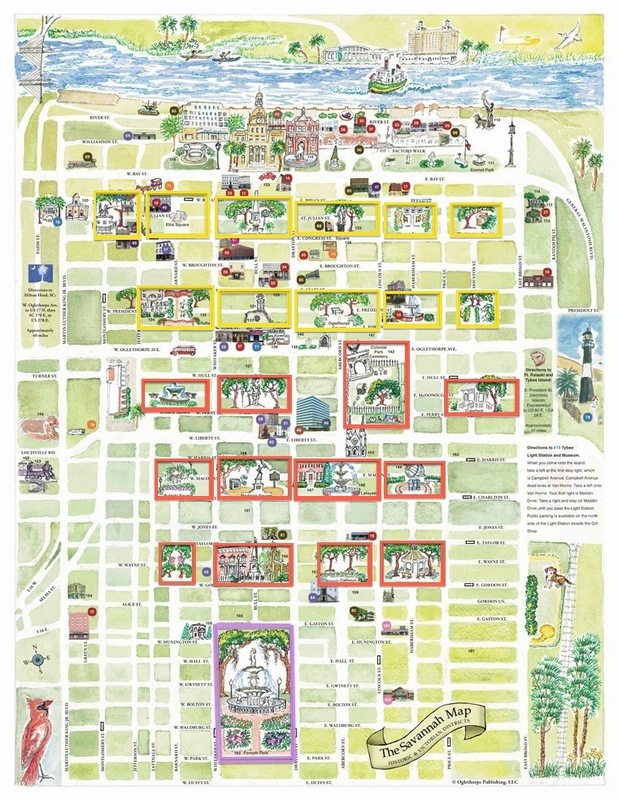 Savannah is widely considered America’s first “master planned” city. One of its most unique features is the system of 27 town squares. Each one is unique and each one is delightful! Walking through the squares under the canopy of the trees, is just delightful! 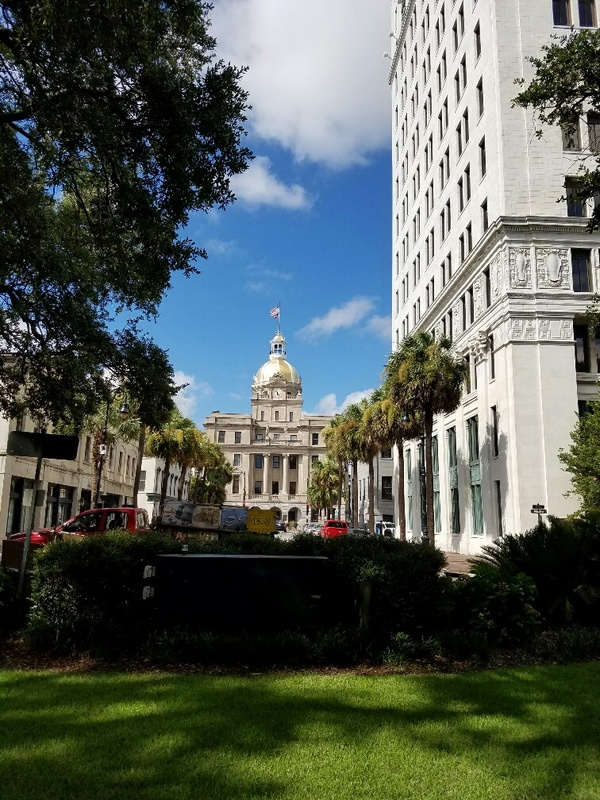 Many movies have been filmed in Savannah. 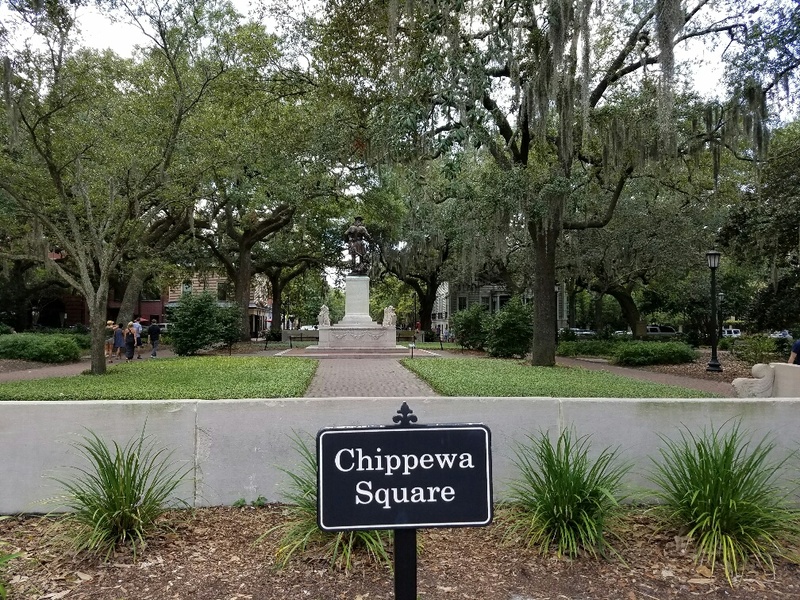 The famous bench where Forrest Gump sat waiting with his box of chocolates for Jenny was located right on Chippewa Square. The bench is gone, replaced by this sign and planter box. But the scene is unmistakable. 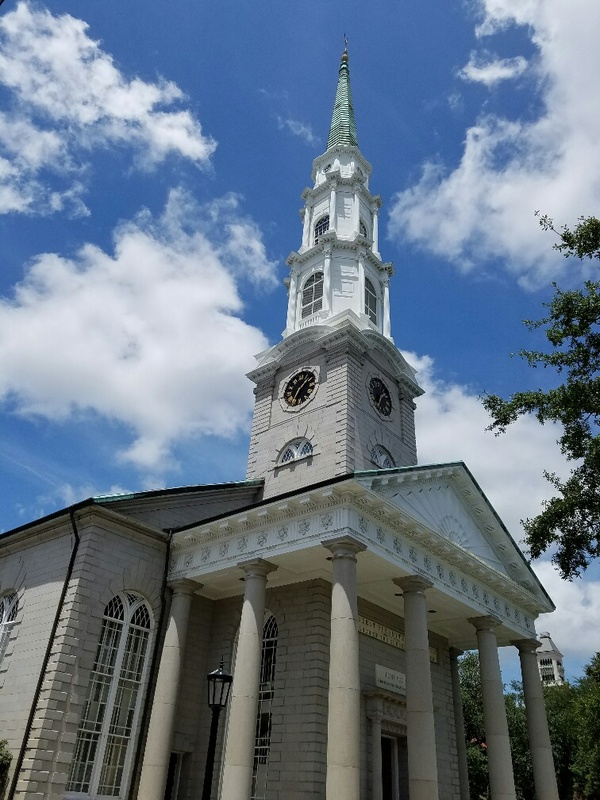 The church steeple where the feather floated down at the beginning and then at the end of Forest Gump is nearby. Just around the block, actually. The squares are gorgeous, as are the buildings surrounding them. 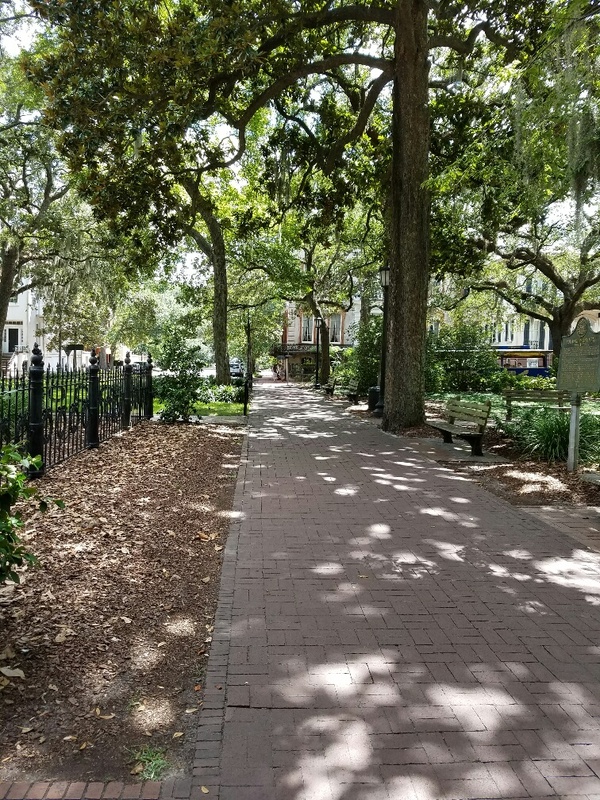 I was struck that much of Savannah reminded me of the Village or the Upper West side in New York. If both of those were cleaned up and the people were nicer. 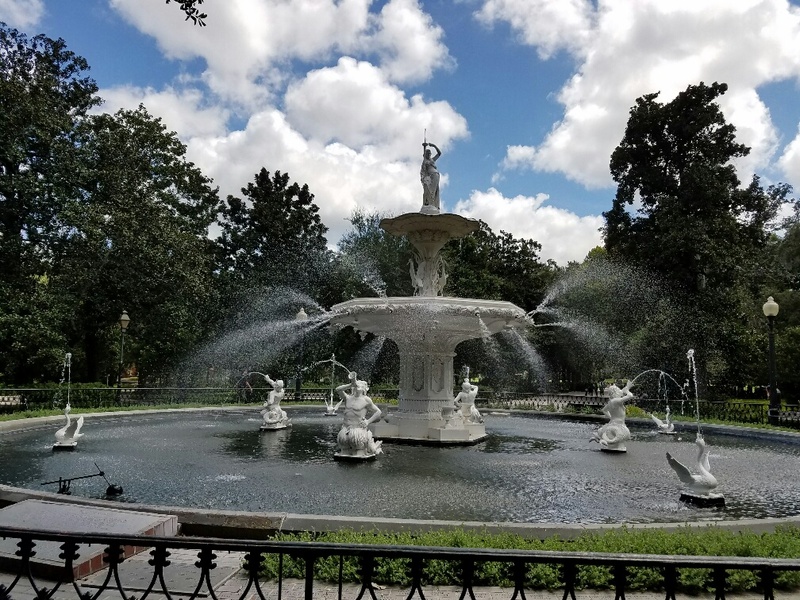 The most famous picture in all of Savannah must be the fountain at Forsyth Park. It looks custom, but believe it or not, it was a mail-order special! City Hall is gorgeous too, with its gold leaf-covered dome. We didn’t need to eat it but that didn’t stop us. 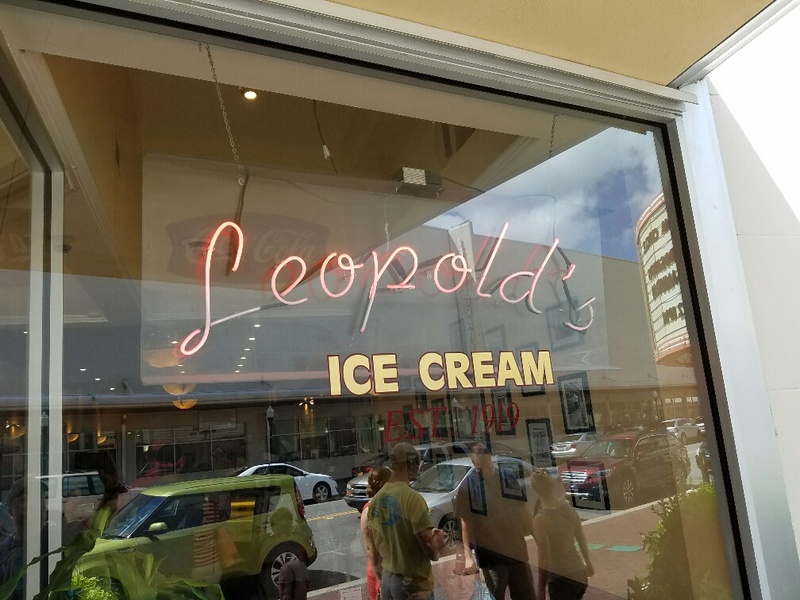 It may have been the most creamy ice cream I’ve ever had! I found that my photos don’t really do justice to Savannah. It has found a very pleasing mix of old and new. Lots of artists and new foodie spots, interesting shopping, and vibrant culture. Without loosing its Southern charm. 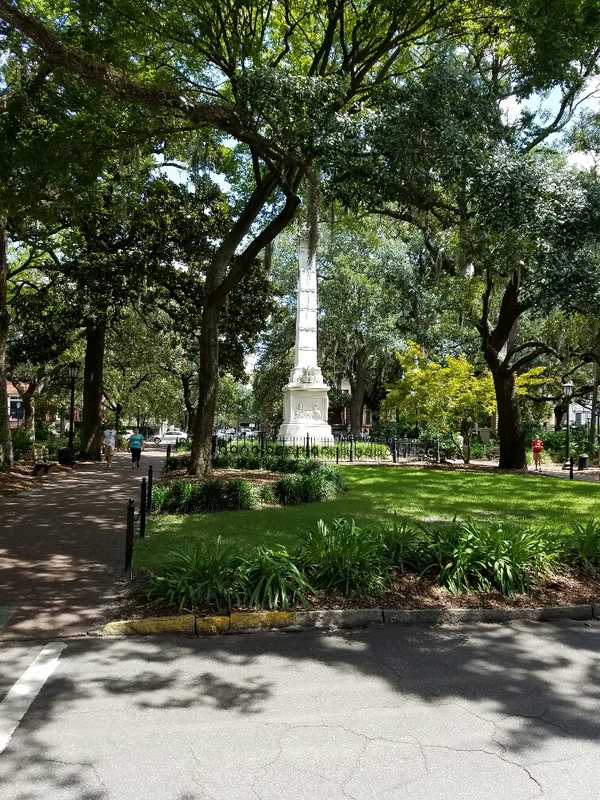 I would have to say that Savannah tops my favorite city list at the moment. And because of the MoHo, we got to live there for a week. I suspect we’ll be back before too long!